The weather may be turning and some parts of the country may already have snow in the forecast, but Starbucks isn't sweating the turn toward winter. Instead, it's encouraging you to flip the bird at cold weather and enjoy a cold drink. For its almost-weekly "Happy Hour" deal, the coffee shop is offering 50% off Frappuccinos on Thursday, October 11. 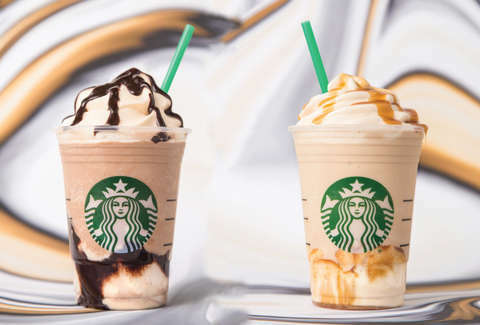 Starbucks locations across the country will be offering "Happy Hour" on Frappuccinos size grande or larger from 3pm until close. That covers all of the chains Frappuccinos except for the ready-to-drink bottles and any Starbucks Reserve beverages. As with past "Happy Hour" promotions, the offer is available at participating locations, and you'll have to be a member of the Starbucks Rewards program to get in on half-price drinks. If you're already a member, you'll get the offer in an email or in your Starbucks mobile app. If you're not a member, you can RSVP on the Starbucks Happy Hour site to get the barcode you'll need to have scanned in-store. If you haven't stopped by your local shop for a "Happy Hour" promotion before, it's worth giving a call to see if they're participating. Then you'll be defiantly sipping a sugary iced beverage despite the weather's insistence on getting colder.